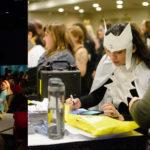 GeekGirlCon 2017 at Washington State Conference Center in Seattle, Washington. October 2017. Photo by Sayed Alamy. Jeremy was introduced to D&D by his older sister when he was six years old. He didn’t know that it was a “boys game” until he was in his teens—heck, even one of the Dungeon Masters from the university in his town was a young woman. But back then, it was written for and by white, heterosexual men. As a queer boy (Jeremy noted that he uses the word queer as an “umbrella term” for the LGBTQ+ community), there were no written options for him. Jeremy’s sister is also a lesbian, so there weren’t any for her. Becoming a game designer, and making D&D as inclusive as possible wasn’t just about himself, but it was about his family. Because he saw all of us. His sister, his friends. 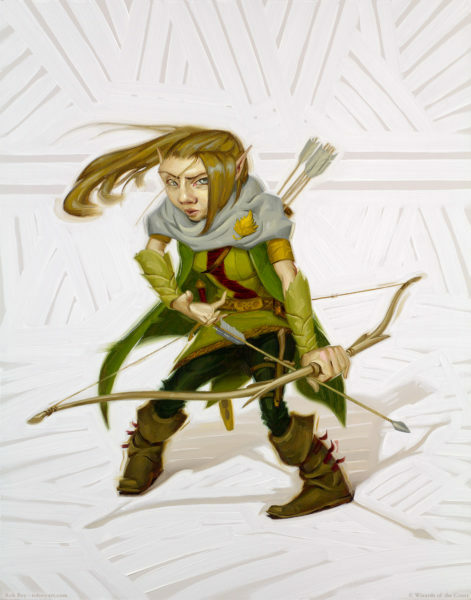 Artwork for the forest gnome ranger as depicted in the 5th Edition, by artist Rob Rey. So, why does this matter? What changed with the introduction of the 5th Edition? Promoting diversity in turn creates authenticity. This is true for narratives outside of gaming, as well. It is vital to include people of all sorts, because the real world includes people of all sorts. “Why are you doing this political thing?” He is often asked, but the answer is simple: “Because we want our stories to feel authentic.” Stories in our media should reflect the world around us, and we should be surrounded by people who look different from us. That’s life, whether we’re dungeon crawling or going to the grocery store. It also embraces inclusion. 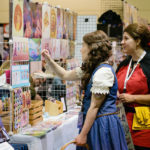 It’s also important and vital to make sure that people know and feel like they have a place, which is much like our mission here at GeekGirlCon. …and it inspires. It helps us think about and tell stories that you otherwise may not have touched. It pushes us to think beyond what we already know by walking in someone else’s shoes, or embracing someone else for who they are and want to be seen as. It’s helps us go further. You can start to ask questions like, how does your character view their sexuality? How about their gender? Have they walked some other path? Beyond gaming, these are questions that I find important as a writer, too, to better understand not only my characters, but the people who read my work (or in Jeremy’s case, the people who play his game). Diversity is strength. The strongest adventuring party is the most diverse adventuring party. Try thinking about it in terms of classes—you have your healers, fighters, and magic users. Same goes for diversity. Different outlooks on life create more mobility and openness for different situations. Jeremy also explained that it was crucial that the art also reflected diversity, as did Art Director Kate Erwin. With this, they tried to make sure that there was a 50/50 split of people who identify as male and people who identify as female in the illustrations. In most games you play as a white man. Often times, it’s literally the only option. To counter this, the team chose to include more women, women of color, people of different statures. This was possibly the most important part of the handbook. They also really wanted to challenge the visual representation of female characters, who are often scantily clad and pristine. No. If you’re playing a female character, she needs stands toe to toe with her male counterparts. You can still find those women with a little less…protective armor tucked in the 5th Edition, but there’s plenty of strong and dominant woman that are ready (and fully-dressed) for battle as well. 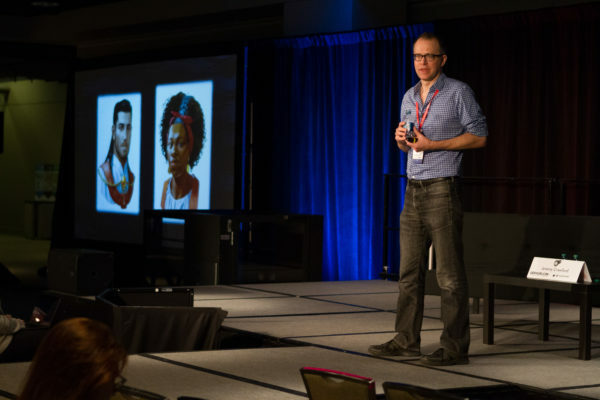 To give another example about how Jeremy worked to implement diversity both visually and contextually, he showed the audience an example: a group of vampire’s consorts. They were diverse because they came from all over the world seeking this immortality. They were all of different genders, different races, but they gathered together to meet a similar goal or ideology. Artwork for the human warlock as depicted in the 5th Edition, by artist Rob Rey. 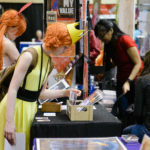 Despite all of the work they’ve put into further diversifying D&D, Jeremy admits there’s still a lot of learning that their creators have to do. Even among their female and queer artists, they still sometimes end up reverting to what they, the player or society, portrays as being dominant (white males). They’re not necessarily used to that freedom of expression, and it’s something they want to make sure everyone is comfortable with. It was also important that they implement diversity via age. Particularly in western games, there are no women over the age of thirty, and not many men in their twenties or younger. “This is someone’s fantasy, but it’s not ours,” Jeremy said. They also want to show men with vulnerabilities and tenderness. In addressing how we portray women, to an extent we also have to change how we portray men. “Oh…no, he’s yelling again?” Jeremy laughed. If we look at popular men in gaming, we think of Corvo Attano from Dishonored, Joel from The Last of Us, or Geralt from The Witcher. “Can we get a guy smiling? Scowling, muscled, yelling guys—we don’t want to spend time with them.” Sure, my dad might daydream about chiseled biceps and flowing silver hair, but the greater majority of the playerbase does not. There are also still subjects of desire. But, it goes beyond the heterosexual, male gaze. Before, the female succubus only appeared on her own—and that was getting pretty tiring. “Why can’t they also summon an incubus?” The succubus has a companion, the incubus. 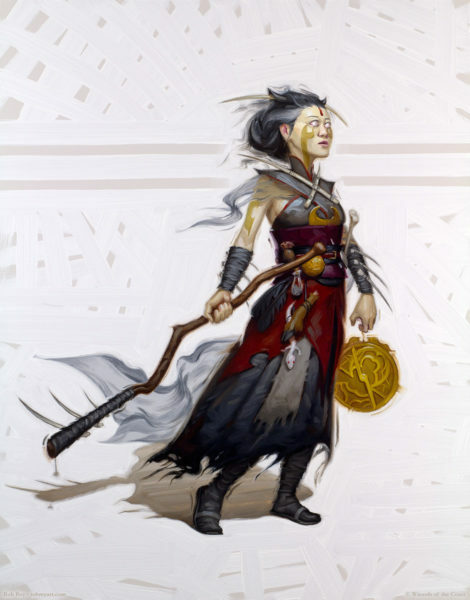 They’ve been apart of real world mythology and lore for just as long, so why aren’t they more present in a game like D&D? Seductiveness is more often only associated with the female. “We also wanting to make sure there were men who were a little hubba hubba,” and thus, they introduced both. When the mic was opened to the audience, just about everyone in the room stood to ask Jeremy a question. Everyone, and I mean everyone, was beaming. Questions ranged from relating to professional interests, to questions about playing the game itself and social aspects of a group (which Jeremy, who grew up playing D&D, was happy to answer). Others just wanted a chance to tell him how much the game meant to them, and the sentiment was genuinely warm. Thanking Jeremy for his efforts and delivery of the 5th Edition, one woman quickly exclaimed, “As a bisexual woman, I appreciate the inclusion of both the succubus and the incubus.” The room fell into a fit of laughter. Even I nodded with appreciation. 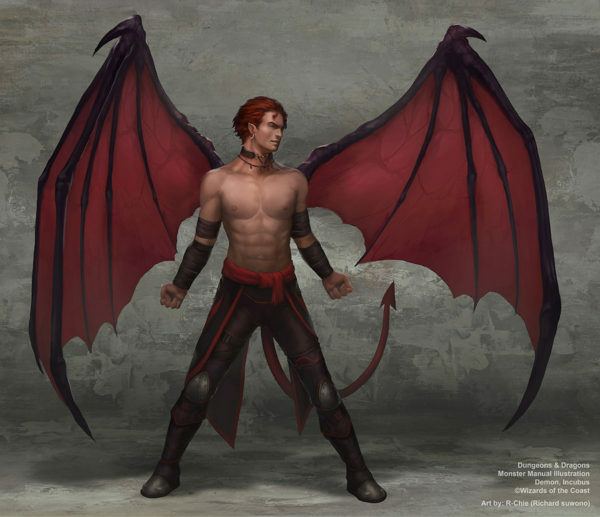 The incubus as depicted in the 5th Edition, art by R-Chie (Richard suwono). Source. Another audience member asked how to approach a challenging conversation with another player, especially when they’re being offensive or coming across as rude. “Always remember that we play games to have fun,” Jeremy said, of any game. If you find yourself in a bad group where you’re constantly uncomfortable, just look for another group. If it’s so devoid of fun, then find people who you enjoy spending the time with. They’re out there. But, he also noted that if there’s hope for the group or individual, try to use the opportunity to start a conversation. Many (but not all) gamers don’t mean harm, they may just not know what’s appropriate to you and will be willing to fix it. In regards to group play, another question asked was how someone could encourage their players to play with and think about using different genders for their characters. The best way is to demonstrate, Jeremy says. Many gamers are willing to experiment, but may need a little help if they’re treading on unfamiliar ground. Like handling more aggressive or otherwise rude players, one of the best ways to resolve conflict or open doors is to talk about it. Finally, a girl in her later teens asked how she could get started as a writer or artist (working on D&D). The gaming industry, whether console-based or tabletop, is still very male-centric, so it can feel a little challenging. At Wizards, Jeremy’s team is very small and they often look to freelance writers and artists to help with the books. But when looking for that talent, he and Chris Perkins try to look for diverse creators. He does admit that they need to work and improve on building a more diverse team in-office, but also pointed out that there are plenty of people in leadership roles that are queer, female, and of color. He and two women predominantly oversaw the production of the 5th Edition. But when they are piecing together a book, they look to the community. So put your work out there, whether you’re an artist or a writer, and you will be seen. Fantasy is a doubled edged sword. Every human culture has some form of fantasy, we all have some sort of immortal ethereal realm where our elven creatures dwell. There’s always this realm that transcends culture. Tolkien said, distinct from science fiction (which looks to the future), fantasy is to feel like one with the entire universe. Fantasy is real, deep human yearning. We look to it as escapism, whether we play D&D, or Skyrim, or you are like myself and write fantasy. There are unfortunately some old cultural tropes that need to be discarded, and it can be frustratingly slow to see those things phased out. There’s a bad correlation of dark skinned people and evil. Evil is black (or charcoal), purple, or an “otherworldly” grey. In Jeremy’s work with Wizards, he yearns to change these tropes. His work on the 5th Edition started to break these boundaries, but there’s still work to be done. He will, with the help of this dedicated, strong community, will improve the game and people’s perceptions piece by piece.